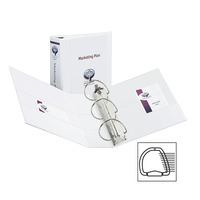 Avery 4 in White EZD Ring Durable View Binder for a sheet size of 11 in x 8-1/2 in provides increased capacity and resists gapping for smooth page turning. Binder featuring durable construction organizes and secures paper with four interior pockets. Binder with rivets exposed on back makes the pages lies flat with back mounted rings. Binder contains 39% post consumer materials.